Colorado — The first generation of the Volkswagen Tiguan has been on the market in Canada for years, but the SUV has continued to hold its own in the face of stiffer and stiffer competition. Still, in spite of its undeniable qualities, namely a comfortable interior, quality finishes and road handling that met the expectations of drivers looking for a higher level of sophistication, the Tiguan did have one glaring fault in the eyes of North American consumers: its smallish dimensions. As part of its bid to increase its presence on the SUV market, Volkswagen developed the all-new Atlas, the largest vehicle it has ever offered to North American consumers. It has followed this up by pumping up the Tiguan to meet the demands of our market. 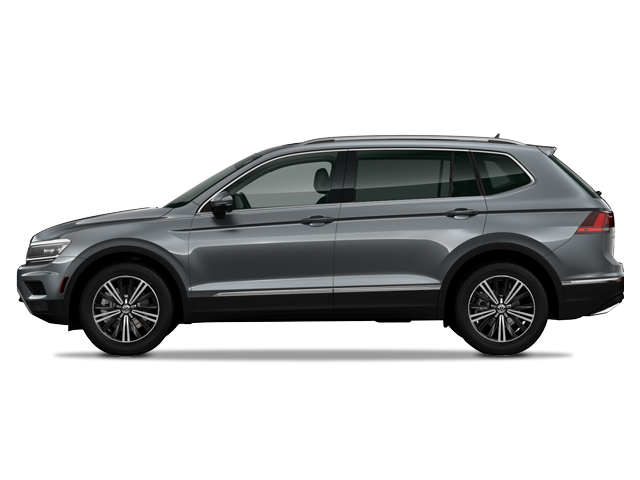 Incidentally, there are two versions of the new Tiguan available in Europe, including one with dimensions more or less equal to the older model. For North America, however, the automaker is only offering the larger of the two versions, which sits on a wheelbase that’s 186 mm longer than the preceding generation, and has a total length that stretches 268 mm longer. What’s more, the use of the MQB modular platform has also widened the Tiguan by some 30 mm, and allows the vehicle to sit 7 mm lower to the ground for an improved aerodynamic coefficient (Cx). These larger dimensions have a noticeable effect on the trunk, without a doubt one of the most criticized elements of the previous Tiguan. In the 2018 model equipped with a 50/50 third row, when that third row is installed cargo space is 12 cu ft (340 litres); remove that seating and available space climbs to 33 cu ft (935 litres); fold down the second row and you increase it further to 65.7 cu ft (1,860 litres). In the 5-passenger model, cargo space is even more generous: the trunk can hold 37.6 cu ft (1,065 litres), and a total of 73.5 cu ft (2,080 litres) when the 40/20/40 seating is folded down. This translates into a 25% increase in comparison with the Tiguan of old. In giving consumers the choice of ordering the 2018 Tiguan with two or three rows of seats, Volkswagen is responding to a growing market trend; the company should also be saluted for its honesty in marketing the vehicle as a 5+2 and not a seven-seat SUV. The last row, in fact, is appropriate strictly for young children, and is a decidedly tight fit for any adult who ventures there. On the other hand, the middle row sits on rails to ease access to the row behind it. As in the past, the finishing is impeccable, the attention to detail impressive. The overall presentation and the dashboard, meanwhile, are typically Volkswagen through and through: everything is within easy reach and the ergonomics are virtually flawless. The infotainment system, however, is not quite as user-friendly as in some competing models, and the navigation system suffered from some minor glitches during our road test. We found nothing to complain about regarding the driver’s position or the comfort level provided by the seats – though we did notice that, perhaps to conform to the preferences of North American consumers, the front seats seemed to be less firm than in the previous Tiguan. The indicator dials are easy to read, and the steering wheel is slightly thicker than average making a good grip easier. On our way back to the hotel at the tail end of our road test, we had a flat tire. This allowed me to learn first, that the spare tire was placed partially underneath the third row of seats, which could theoretically at least make getting at it difficult, and second, that the engineers at Wolfsburg have come up with a system that allows for lifting up and moving forward the rear bench thanks to pneumatic supports, making removal of the spare tire a breeze. The road-handling qualities of the Volkswagen Tiguan have migrated successfully to the new edition. In particular, the older model offered strong stability when cornering while avoiding being excessively firm. Even with its larger dimensions, the 2018 version has retained these qualities. And if the power steering makes you nervous, you can rest easy: it proved itself to be precise and offered just the right amount of power assistance. We powered the car through a number of tight turns on mountain roads, and none gave the Tiguan any kind of trouble. VW is offering only the one engine set-up, a 2.0L 4-cylinder that is in fact a new and improved version of the engine previously offered, and weds it to an 8-speed automatic transmission box. At first glance, the 184 hp and 221 lb-ft of torque generated by the engine seems a tad insufficient, but the powertrain performed to our satisfaction throughout a road test that was carried out at altitudes surpassing 2,500 metres and in temperatures hovering around 35 degrees Celsius. In more normal conditions as prevail in most parts of Canada, there’s no doubt its performance will be more than adequate. By the way, the 2018 Volkswagen Tiguan equipped with four-wheel drive (4MOTION) promises an average fuel consumption of 10.1L/100 km. And that 4MOTION system is quite sophisticated, offering several modes that drivers can choose from. On the other hand, some buyers may be disappointed with the vehicle’s 1,500-lb towing capacity. At the time of writing this review, the manufacturer has not yet announced Canadian pricing, though American prices have been divulged, giving us an idea of what to expect here. In the U.S. the front-wheel-drive base model is selling for $25,345 USD. The first units of the new model are expected to arrive at dealerships at the beginning of September in provenance from VW’s plant in Puebla, Mexico. Visitors to showrooms will then discover in the second-generation 2018 Volkswagen Tiguan a vehicle that is more spacious, more sophisticated and better adapted to their needs.